After one day spending trying to make a good implementation of libraries for future use, I decided to switch to HAL drivers because of STM32F7 line which does not have STD drivers. So I decided to make libraries that way, that are supported also with STM32F4xx lines. Each line uses HAL driver for it’s version, but all projects are done in a way that you select target in Keil uVision (F4 or F7), click rebuild and everything is setup and ready for start. My plan is to support F0 series also, because with F4/F7 series you get mainstream power, but F0 can be used for small projects. There is not need for F1,F2 or F3. 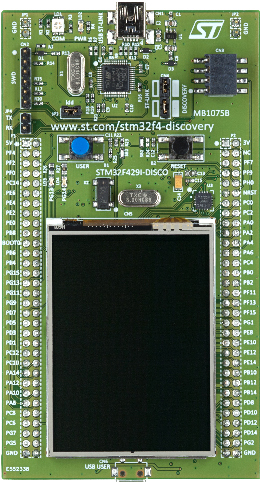 TOUCH: For touch controllers on STM32F7-Disco and STM32F439-Eval boards (built-in) or any other touch controller user can imagine with support for touch orientation to match LCD orientation. For now, libraries are only available on my Github account where you can download it with default project for Keil uVision. Libraries are almost fully compatible with my previous for STD drivers on F4xx lines. Only some functions are added/changed because now are used HAL drivers and not STD anymore. You can select your target in Keil uVision (F4xx or F7xx) and hit rebuild and then download. You are ready to RUN! I’m waiting for your opinion about that feature supporting more series with single library file. This is a simple example from my “project template” used for turn on and off leds with button. Check my GITHUB account with new repository for new library system.